New 4G LTE ZenFone models will arrive at CES 2015 powered by Intel chips and expected to hit the market starting around $330 USD soon after that. Asustek CEO Jerry Shen revealed to the press the company's plans to add 4G LTE-capable ZenFone models to its lineup in early 2015. 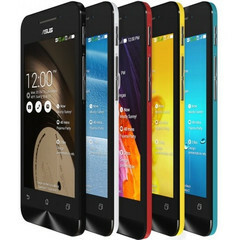 The Intel-powered handsets will be unveiled in the United States in January, at the Consumer Electronics Show. Next year's event will take place in Las Vegas as usual and will be open to the public between January 6 and January 9. Shen mentioned that all the new ZenFone devices that will be shown at CES 2015 will have Intel chips inside and 4G LTE connectivity. According to Asustek's CEO, 4G LTE-capable smartphones will account for 30 percent to 40 percent of the company's total shipments in 2015. Asus plans to expand the reach of its low-cost ZenFone family from 14 markets to 20 markets, increasing its focus on China and Japan. In addition to the Intel-powered handsets which will start around $330 USD, smartphones with processors from a second supplier will also launch in January for about half that price. More information about these handsets should come out soon.